World s top manufacturer of performance camshafts, lifters, valve springs, rocker arms and related valve train parts for all race and street performance engines. 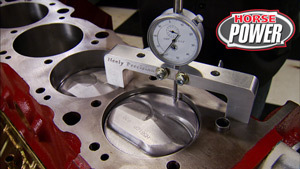 (ANNOUNCER)>> ALL ENGINES HAVE THEM, NOW LEARN THE SECRETS OF PERFORMANCE CAM SHAFT DESIGN, MANUFACTURING, AND TESTING. 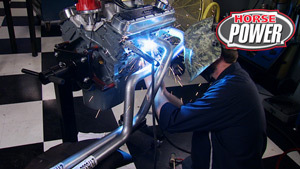 HORSEPOWER TAKES YOU BEHIND THE SCENES AT COMP CAMS. THEN IT'S OFF TO MEMPHIS INTERNATIONAL RACEWAY FOR A BOW TIE BASH ON THE DRAG STRIP AND SHOW CAR CORRAL. IT'S ALL FUN AND ALL CHEVY. (CHRIS)>> THANK YOU FOR CALLING COMP CAMS, THIS IS CHRIS, CAN I HELP YOU? AND WELL HERE'S A TIP. THE MORE INFORMATION YOU CAN PROVIDE THEM ABOUT YOUR APPLICATION, THE BETTER THEY CAN HELP YOU. 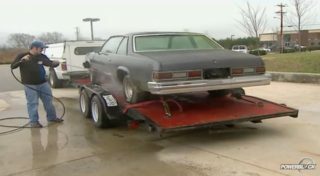 (DAVID)>> WHAT THEY'RE GONNA BE USING THE CAR FOR IS VERY IMPORTANT. REAR END RATIO, TIRE SIZE, WHAT KIND OF STALL CONVERTER IF ANY THEY HAVE IN IT. THERE'S A LOT OF INFORMATION THAT GOES INTO PICKING THE RIGHT CAM. (JOE)>> DAVID ISLING OVERSEES THE COMP CAMS TECH CENTER. (BRIAN)>> COMP CAMS, THIS IS BRIAN, HOW MAY I HELP YOU? (JOE)>> PHONE LINES ARE OPEN SIX DAYS AND NOWADAYS YOU CAN HAVE A REAL TIME ONLINE CHAT WITH AN EXPERT TECH. ( )>> OKAY TELL ME WHAT YOU GOT. WE CAN RECOMMEND WHAT THEY NEED TO GO TO. (JOE)>> EVEN TODAY ONE OF THE MOST COMMON MISTAKES THEY HELP CUSTOMERS AVOID IS GETTING TOO MUCH CAM FOR THEIR PARTICULAR ENGINE. (DAVID)>> IT'S REALLY MORE ABOUT GETTING THE RIGHT CAM FOR YOUR SETUP MORE THAN JUST BUYING THE BIGGEST ONE YOU POSSIBLY CAN. YOU KNOW A LOT MORE TIMES THAN NOT YOU'LL HURT YOURSELF GOING WITH TOO BIG OF A CAM. YOU'LL ACTUALLY LOSE POWER. (JOHN)>> NOW ONCE YOU AND YOUR TECH GUY COME UP WITH A CAM SHAFT THAT YOU NEED, WELL IT'S TIME TO GET IT TO YOU. NOW MOST CAMS THEY'RE GONNA FIND THAT'LL WORK RIGHT OUT OF THE PARTS CATALOG. NOW SOME OF YOU GUYS NEED A CUSTOM TOUCH, SO THEY'LL START WITH WHAT'S CALLED A UGL, OR AN UNGROUND LOBE CAM SHAFT. ONE OF THESE CUSTOM CAMS TO YOU IN UNDER 24 TO 48 HOURS. NOW YOU SHOULD BE PROUD OF THE FACT THAT IT DOESN'T COST ANYTHING EXTRA TO GET ONE. MOST CAMS ARE GROUND USING THE COMPANY'S NEWER CNC MACHINES. OLD SCHOOL ITALIAN MADE BURCOS ARE STILL MAINSTAYS, ESPECIALLY FOR FINISHING WORK. 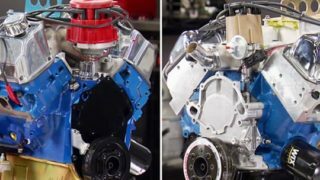 COMP PRODUCES MORE FLAT TAPPET CAMS THAN ROLLERS, AND MORE CARBURETED ENGINE CAMS THAN EFI CAMS. BUT THAT'S GRADUALLY CHANGING THANKS TO EASIER EFI TUNING. (BILLY)>> IT'S ACTUALLY MEASURING I THINK FOUR TIMES EVERY DEGREE THE LIFT. (JOE)>> BILLY GODBOLD SPECIALIZED IN NUCLEAR PHYSICS BEFORE COMING TO COMP IN 1995. HE'S NOW THE SENIOR ENGINEER WHO OVERSEES ALL VALVETRAIN R&D AND PRODUCTION. ASKING OURSELVES, WHAT WOULD I THINK ABOUT THIS PRODUCT. YOU KNOW, KNOWING EVERYTHING THAT I KNOW, WOULD I FEEL LIKE THIS IS SOMETHING THAT I'D BE EXCITED TO PUT IN MY CAR. (JOE)>> KENNY ARENDALE WAS COMP'S FIRST EMPLOYEE BACK IN 1976. KENNY HAS PRECISION GROUND CAMS FOR A LOT OF WINNING RACERS OVER THE YEARS, IN BOTH NASCAR AND NHRA. USUALLY SUPER STOCKERS AND STOCKERS, NHRA, IHRA. THEY TOOK ME OFF OF DOING THE NASCARS ON THE OLD BURCO AND BROUGHT ME OVER HERE. AND YEAH, I WAS A LITTLE APPREHENSIVE AT FIRST BUT SINCE I'VE GOTTEN OVER HERE I LOVE IT. (JOE)>> WOULDN'T GO BACK I BET. (KENNY)>> OH I WOULDN'T GO BACK, NO, NO, NO, NO. INTO THIS INSPECTOR GAUGE. IT LOOKS AT EVERYTHING FROM JOURNAL DIAMETER AND ROUNDNESS, TO LOBE SEPARATION ANGLES AND DURATION. IN OTHER WORDS IT'S GOT TO BE RIGHT BEFORE IT GOES OUT. HE HAS A GOOD EXPERIENCE HE'S A HOT RODDER FOR LIFE. IF HE HAS A BAD EXPERIENCE, WHETHER IT'S FROM ONE OF OUR PRODUCTS OR ONE OF OUR COMPETITOR'S PRODUCTS, OR SOMEBODY ELSE THAT'S IN THE INDUSTRY'S PRODUCT. HE'S GONNA FIND A DIFFERENT HOBBY. (JOHN)>> A LOT OF FLAT TAPPET CUSTOMERS ARE OPTING FOR A PRO PLASMA NITRATING PROCESS. IT'S A 36 HOUR PROCEDURE IN WHICH NITROGEN IONS ARE EMBEDDED INTO THE METAL FOR A 100 PERCENT IMPROVEMENT IN DURABILITY. OUT THEIR DOOR AND SOON TO ARRIVE AT YOURS. COMP CAMS IS THE FORERUNNER IN THE MAKING OF CUSTOM HIGH END RACE CAMS. NEXT THE LIFE STORY OF A BUMP STICK MADE TO WIN RACES. 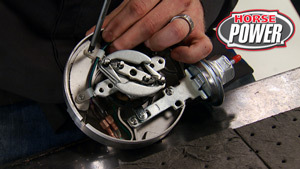 (JOE)>> WELCOME BACK TO HORSEPOWER AND THE ORIGINAL HOME OF COMP CAMS. 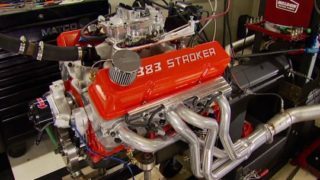 WE'RE GETTING THE ALL ACCESS BACK STAGE TOUR OF THIS MEMPHIS FACILITY THAT'S ALL ABOUT PERFORMANCE VALVETRAIN PARTS PRODUCED BOTH WITH CNC TECHNOLOGY AND WITH SKILLED HANDS. (JOHN)>> THESE HANDS ARE BUSY ASSEMBLING NEW MAGNUM SERIES COMP ROLLER ROCKER ARMS WITH PLENTY OF PERSONAL Q/C CHECKS ALONG THE WAY. ( )>> IF YOU GET A SLIGHT MOVEMENT BACK AND FORTH BETWEEN THE AXLE AND THE ROLLER, THEN YOU'RE GOOD TO GO. (JOE)>> SINCE THE COMPANY'S LAUNCH IN 1976 COMP HAS ENJOYED A REPUTATION FOR PRODUCING QUALITY CAM SHAFTS. (JOHN)>> WHETHER IT'S A RACE CAM OR A NEW PRODUCTION STREET CAM, IT USUALLY STARTS HERE IN DESIGN. USING HIGH TECH SOFTWARE PACKAGES, SOME THAT ARE EVEN PROPRIETARY. THESE YOUNG ENGINEERS KNOW THEIR STUFF BUT PERHAPS HAVE NO IDEA WHAT IT WAS LIKE TO START A NEW CAM DESIGN A FEW DECADES AGO. (BILLY)>> YOUR ARTISTIC ABILITIES WERE A MAJOR, MAJOR FACTOR IN WHETHER YOU COULD BE AN ENGINEER OR NOT. THE OLDER ENGINEERS JUST DO BEAUTIFUL SKETCHES WITH HIGH PRECISION. BUT YEAH, IT WAS TOTALLY DIFFERENT. (JOE)>> THE PRODUCTION PROCESS STARTS WHEN THE CAM DESIGN IS PLUGGED INTO A PROGRAM THAT MACHINES OUT THE TOOL PATH NEEDED TO CREATE A CORE. ENGINEER DANIEL FREEMAN IS LOADING UP A ROUND BAR OF BILLET STEEL IN THIS SEVEN AXIS CNC MACHINE FOR A NEW PRO STOCK CAM. (DANIEL)>> YOU CAN LISTEN TO IT, HEAR IT, AND WATCH THE CHIP FORM CAUSE YOU WANT ALL THAT HEAT THAT YOU'RE GENERATING TO GO IN THAT CHIP AND GET CARRIED AWAY. (JOE)>> THE OKUMA MACHINE IS AN ALL IN ONE UNIT THAT FIRST CARVES THE CAM CORE. LATER USING ANOTHER PROGRAM IT CAN ALSO GRIND THE JOURNALS AND LOBES. (JOHN)>> THAT IS AFTER FIRST CHECKING AND VERIFYING ALL THE CAM'S LINEAR SPECS AND MACHINE TOLERANCES ARE IN QUALITY. (JOE)>> AFTER HEAT TREAT THE CAM COMES BACK FOR MORE TESTING, THIS TIME FOR METAL HARDNESS. WHEN IT GETS THE GO AHEAD, JOURNALS AND LOBES ARE FINAL GROUND FOLLOWED BY INSTALLATION OF THE PRESS FIT GEAR. (JOHN)>> NEXT LOADED INTO THE ADCOLE GAUGE, THE GROUND LOBES AND JOURNALS ARE MEASURED. AND FINALLY A PROFILOMETER THAT RUNS A STYLUS OVER EACH LOBE FACE TO MEASURE ITS SMOOTHNESS. (BILLY)>> WHAT YOU WANT TO SEE IS A SURFACE THAT HAS MOSTLY VALLEYS AND KINDA PLATEAUIE OVER THE TOP. (JOE)>> IF THIS CAM WERE IN THE PROTOTYPE STAGE IT WOULD ALSO SPEND MANY HOURS IN THE R&D TEST CENTER. THIS IS WHERE ENGINEERS AND TECHNICIANS APPLY REAL WORLD CHALLENGES TO DESIGNS BEFORE THEY GET THE PRODUCTION GREEN LIGHT. (JOHN)>> THE SPINTRON USES A TRACKER LASER AND A STRAIN GAUGE FOR DYNAMIC TESTING OF A COMPONENT SUCH AS VALVE MOTION THROUGHOUT THE ENTIRE RPM RANGE. 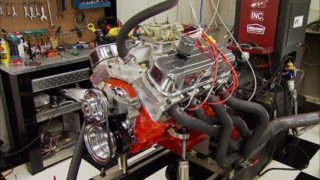 (BILLY)>> SO WHAT WE'RE REALLY DOING IS TAKING OUT ALL THE CONNECTING RODS, PISTONS, FUEL, COMPRESSION, SPARK, ALL THAT AND JUST RUNNING THE VALVETRAIN TO ISOLATE THAT SYSTEM FROM EVERYTHING ELSE. (JOHN)>> OR IT CAN SIMULATE ANY RACE TRACK IN THE COUNTRY TO TEST A VALVETRAIN'S DURABILITY. (BILLY)>> IT'S MUCH MORE EXPENSIVE TO LEARN THIS STUFF ON A RACE TRACK THAN IT IS ON A SPINTRON. (JOE)>> WHETHER YOUR NEW CAM COMES FROM COMP'S VAST INVENTORY, A CUSTOM GRIND, OR A SPECIAL RACING DESIGN, THERE'S A LOT OF EXPERIENCE, RESEARCH, AND TESTING BEHIND IT. BUT ITS SUCCESS ALSO DEPENDS ON YOU THE BUILDER. (BILLY)>> GOOD ENGINES USUALLY HAVE GREAT PARTS. GREAT ENGINES ALWAYS HAD A GREAT PLAN. (JOHN)>> HEY WELCOME BACK TO HORSEPOWER. WELL WE DECIDED TO FOLLOW THOSE COMP GUYS OUT TO WHERE THEY PUT THAT VALVETRAIN TECHNOLOGY TO GOOD USE. (JOE)>> YEAH, ON THE TRACK HERE AT MEMPHIS INTERNATIONAL RACEWAY. IN FACT WE'RE ON A MISSION TO SEE WHAT'S SUPER ABOUT THE SUPER CHEVY SHOW. (JOE)>> WHAT'S THIS THING IN YOUR EAR? (JOHN)>> IT'S MY DIRECT CONNECTION TO ELVIS. INTERNATIONAL RACEWAY TO CELEBRATE ALL THINGS CHEVY. RACING IN EVERYTHING FROM BRACKET CARS TO PRO MODS. A CAR SHOW LOADED WITH SHINY BOW TIE SHEET METAL, SWAP MEET WHERE YOU CAN WHEEL AND DEAL, AND ALL THE SIDE SHOW ATTRACTIONS THAT MAKE FOR A PRIMO HIGH PERFORMANCE PARTY. LAST YEAR'S PRO MOD WINNER DEWAYNE WATKINS BROUGHT HIS BLOWN 526 INCH '57 BACK IN HOPES OF A REPEAT PERFORMANCE. (DEWAYNE)>> I THINK I'M GONNA GO FAST. (JOHN S.)>> I REMEMBER COMING TO THE SUPER CHEVY SHOWS WHEN I WAS JUST EIGHT, NINE YEARS OLD THINKING TO MYSELF, MAN I'D LOVE TO DO THAT ONE DAY, AND HERE WE ARE. SETUP THAN BEFORE. WE JUST ARE SWITCHING OVER FROM A ROOTS BLOWER TO THIS SCREW BLOWER. SO WE'LL HAVE A LITTLE LEARNING CURVE. (JOE)>> IN TODAY'S FIRST ROUND JOHN HAD ISSUES TRYING TO PLANT THE RIGHT POWER LOAD TO THE PAVEMENT. AT THESE SUPER CHEVY EVENTS SHOW CARS GET EQUAL BILLING WITH RACERS. THIS SHOW WAS AN ALL STAR LINE UP FROM SEVERAL DECADES OF CHEVY PRODUCTION. (JIM)>> IT'S AN EMBARRASSMENT OF RICHES AND I'M HAPPY TO HAVE IT. (JOE)>> EVEN SUPER CHEVY'S MAGAZINE EDITOR WAS BLOWN AWAY BY THE QUALITY HERE. 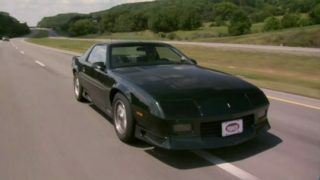 (JIM)>> EVERY TIME YOU THINK YOU'VE SEEN ONE THAT'S THE NICEST ONE YOU'VE EVER SEEN, THERE'S TWO MORE NEXT WITH IT THAT ARE JUST AS NICE OR NICER. THE GOLD CLASS IS BY INVITATION ONLY. YOU CAN'T BUY YOUR WAY INTO THE GOLD CLASS. IF IT MEETS A CERTAIN JUDGING STANDARD THEY WILL INVITE INTO THE GOLD CLASS. THERE' JUST SPECTACULAR. THEY'RE ABSOLUTELY THE BEST OF THE BREED. 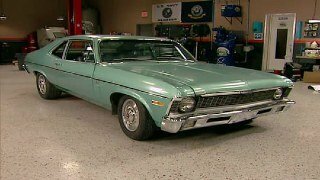 (JOE)>> THIS GOLD CLASS '67 NOVA ATTRACTED THE MOST ENVIOUS EYEBALLS. IT'S PERHAPS MORE ART THAN RESTORATION. LOADED WITH CLASSY DETAILS FRONT AND BACK. THE OWNER BROUGHT IT FROM KANSAS, ALONG WITH FIVE OTHER NOVAS PARKED ON THE CONCOURSE. (JIM L.)>> JUST A PASSION FOR NOVAS. IT'S A BAD ADDITION. 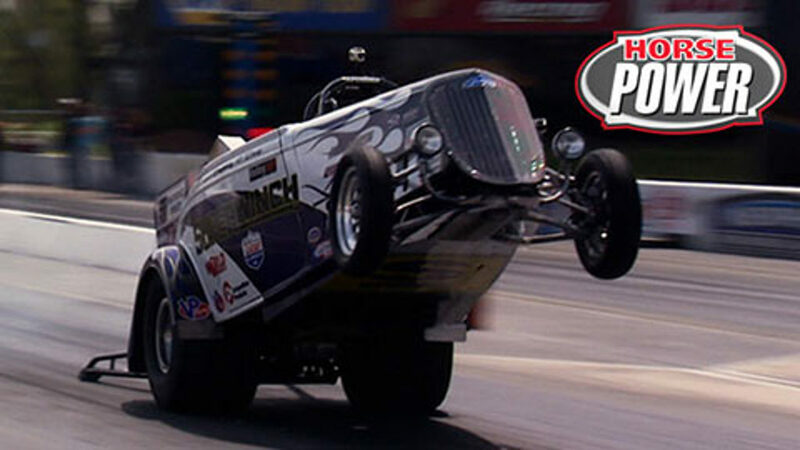 (JOE)>> SUPER CHEVY SHOWS ALWAYS FEATURE EYE POPPING, GROUND SHAKING SIDE SHOW EVENTS, LIKE THESE JET FUNNY CARS FROM HANNAH MOTORSPORTS. THE DRIVES ARE COMPETITORS, TEAM MEMBERS, AND CHILDHOOD BUDDIES. 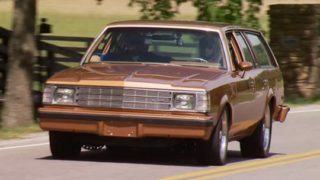 (KEN)>> WE'RE STILL BEST FRIENDS BUT WHEN THE BODY GOES DOWN AND THAT MOTOR IS RUNNING , WE'RE ARCH RIVALS. (RICH)>> WE THINK WHAT MAKES A GREAT SHOW IS THE CARS GOING DOWN THE TRACK SIDE BY SIDE. SO WE TRY TO TUNE THE CARS ACTUALLY SO THAT THEY RUN THE SAME NUMBERS, THE SAME ROUTINE. THE SAME MILE AN HOUR. AND BASICALLY WHEN YOU WATCH US RUN, WHOEVER GETS OFF THE STARTING LINE FIRST WINS. (JOE)>> IN PRO MOD COMPETITION SULLIVAN'S PROBLEMS WENT FROM DIALING IN HIS ENGINE COMBINATION TO ANOTHER ISSUE OUT BACK. (JOHN)>> THE CAR LEFT GOOD AND EVERYTHING AND BROKE THE WHEELIE BAR ON THE BACK AND DRUG THE CAR RIGHT, PUT IT INTO TIRE SHAKE. (JOE)>> MEANWHILE LAST YEAR'S WINNER, WATKINS, WAS SHUT DOWN BY JERRY PRATER IN HIS '66 VETTE, HE WOULD GO ON TO WIN THE EVENT. BUT IT'S THE PEOPLE THAT MAKE THIS A FIRST RATE GEARHEAD PARTY. I RAN INTO ONE WHO'S A VETERAN DRAG STRIP ENTERTAINER WHO NEVER LETS THE CROWD DOWN. 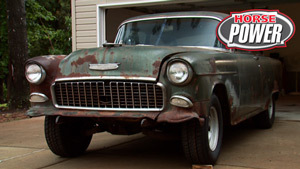 (JOE)>> WELCOME BACK TO HORSEPOWER AND SUPER CHEVY IN MEMPHIS. EVENTS LIKE THIS NOT ONLY SYMBOLIZE THE FESTIVE HOT ROD CAR CULTURE OF TODAY, THEY ALSO CARRY ON SOME CROWD PLEASING TRADITIONS THANKS TO HIGH PERFORMANCE ENTERTAINERS LIKE DANNY O'DAY AND HIS SUPER WINCH WHEEL STANDER. (DANNY)>> I LOVE IT, IT'S AWESOME. MY HEART STILL POUNDS WHEN I GET IN THIS THING LIKE IT'S PROM NIGHT. (JOE)>> DANNY CARRIES ON A DRAG STRIP TRADITION THAT BEGAN BACK IN 1965. BILL "MAVERICK" GOLDEN WAS THE FIRST DRIVER TO THRILL FANS WITH HIS TWO WHEEL QUARTER MILE RUNS. HIS LEGENDARY LITTLE RED WAGON WAS OFFICIALLY THE FIRST PURPOSE BUILT WHEEL STANDING VEHICLE. A DODGE COMPACT PICK UP POWERED BY A 426 HEMI MOUNTED BEHIND THE CAB. HIS 11 SECOND PASSES WERE A MARVEL TO SEE BACK THEN AT LEAST. (DANNY)>> I WASN'T A REAL GOOD BRACKET RACER. I LOVED IT BUT I WAS MORE INTERESTED IN SHOWING OFF. SO THE NATURAL PROGRESSION I GUESS WAS THIS THING. HIS FIRST WHEEL STANDING TRUCK, BEFORE MOVING ON TO OTHER TAIL DRAGGING QUARTER MILE CROWD PLEASERS. HE'S RUN HIS BEST TIMES IN THIS '34 SUPER WINCH HE BROUGHT TO MEMPHIS. (DANNY)>> I WAS A RACER BEFORE I WAS CLOWN. SO I STILL WANT TO GO FAST. I ACTUALLY HOLD THE WORLD RECORD AND I'VE GONE 854 IN THE QUARTER AT 157 MILES AN HOUR ON TWO WHEELS. (JOE)>> IS THAT WHY NOBODY WANTS TO RACE YOU? (DANNY)>> YOU KNOW, WHEN YOU'RE BEAUTIFUL EVERYBODY HATES YOU. MY LINE OF SIGHT IS RIGHT DOWN PARALLEL WITH STEERING, ABOUT SIX INCHES ABOVE IT. MY ACTUAL POINT OF EYE CONTACT WITH THE TRACK IS ABOUT 300 FEET IN FRONT OF ME. MY RIGHT HAND STAYS ON THIS LEVER. THIS IS MY STEERING WHEN I'M IN THE AIR. AND FORWARD IS MY LEFT BRAKE, BACK IS MY RIGHT. YOU'D BE SURPRISED HOW MUCH YOU'VE GOT TO GET AFTER IT. IT IS NOT TOUCHY BECAUSE I'M ACCELERATING REALLY HARD. (DANNY)>> AND THE CROWD WENT WILD. THAT'S WHY WE DO IT, IT'S CERTAINLY NOT FOR THE MONEY. (JOHN)>> WHEN WORKING ON ANY PROJECT THAT REQUIRES MOVING SOME METAL, GO AHEAD AND USE SOME WD 40 MULTI USE PRODUCT. IT'LL PENETRATE AND LUBRICATE THE CUTTING TOOL AS WELL AS THE PARTS. CASE IN POINT, DRILLING. 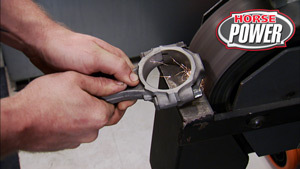 WD 40 COOLS DOWN THE METAL BEING WORKED, AND LUBRICATES THE EDGES A BIT TO PREVENT PREMATURE DULLING. A FREE TUNE TO GET YOU UP AND GOING IN NO TIME. NOW ARE YOU WORRIED ABOUT ADEQUATE FUEL DELIVERY WITH YOUR EXISTING LOW PRESSURE PUMP? WELL THEY'VE GOT YOU COVERED THERE TOO WITH THIS UNIVERSAL SUMP FUEL KIT. IT'S A SELF CONTAINED TANK, HIGH PRESSURE PUMP, AND REGULATOR THAT FITS UNDER YOUR HOOD. 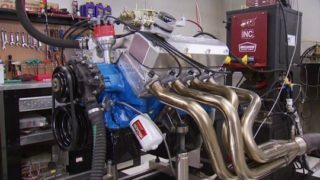 NOW IT DELIVERS A CONSTANT 60 PSI OF FUEL, AND IT SUPPORTS UP TO 600 HORSEPOWER AND NO RETURN LINE IS REQUIRED. YOU GET BOTH OF THEM AT SUMMIT RACING, AND OF COURSE GET ANOTHER HELPING OF HORSEPOWER HERE NEXT WEEK.